The Battle of Atlanta is assuming the status of a major event in American history. Modern historians are looking at the battle as a crucial event in the election of 1864. At the time, Virginia and Grant’s Overland Campaign occupies the public’s attention. The New York Times and Harper’s Illustrated Weekly only take note of the death of General McPherson in fighting outside of Atlanta. Historians maintained that view for years. Slowly, things changed and the Atlanta Campaign assumed real importance in the history of the Civil War. With the war in the East a bloody stalemate, the Union victory leading to the fall of Atlanta help convince a war-weary public that victory was coming. This makes Lincoln a winner ensuring his election in November. The fighting on July 22, 1864 is the major event in the fall of Atlanta and by extension Lincoln’s reelection. Jefferson Davis removed Joe Johnston for showing insufficient aggressiveness, replacing him with John Hood. Hood was very aggressive initiating a series of attacks trying to force Sherman back from the city. The major attack was on the 22nd, directed at McPherson’s army. A series of marches tried to place the majority of Hood’s army on Sherman’s flank and rear. What followed was the bloodiest day of the campaign. Hit in the front, flank and rear with McPherson killed; the army maintained the critical positions and beat back the Confederate attacks. Starting with the overall situation, the author walks us through the planning, the march and the attacks. This book takes these events and presents them in a logical, sequence that allows the reader to follow a complex and chaotic battle. This is an excellent book with well-placed useful maps, good illustrations and the fine writing of Gary Ecelbarger. He is emerging as one of our best authors and this book strengthens his claim to that honor. This is a must-read book on this battle and is one of the best books on the subject. This is a readable but serious history with full endnotes, Bibliography and index. This book looks at the battlefield not as an isolated area but as part of the growth of the city and preservation. Preservation is not a pretty picture. The city grew over the battlefield and the interstate highway system completes the destruction. What is left is the cyclorama and very good histories like this one. I enjoyed the book. I loved the way the author illustrated the situation and planning of both commanders. The battle scenes got a bit rough, the author going excessive detail about each unit involved all the way down to company level. I would definitely recommend this book. 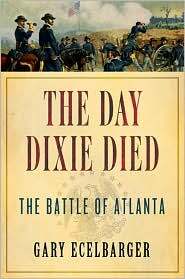 One of the better books I’ve read on the Battle of Atlanta.